Click here to see Availability Calendar containing dates that villa is available for hire. 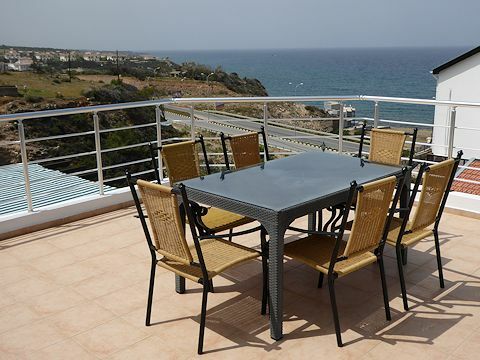 Hire of the villa starts from 4pm and terminates at 10am on the agreed dates. This should be borne in mind when viewing the availability calendar. This availability calendar is updated frequently but villa availability is not confirmed until you receive your booking confirmation email. We can invoice via PayPal allowing a hirer to pay by credit or debit card. However, if a hirer does want to pay by credit/debit card through our Paypal emailed invoice or through their own Paypal account, we regret this will incur a 4% surcharge (which is unfortunately what we will be charged by PayPal). Customers outside the UK are responsible for all IBAN transfer charges. A non-refundable deposit of 25% of the total hiring charge is required to secure a booking. The balance of the hire charge is due 8 weeks prior to your arrival together with a Security Deposit of £200. The £200 Security Deposit will be returned not more than 10 days after your departure subject to any deductions for losses and/or damage. The rates shown above are the weekly hiring rates for the villa. 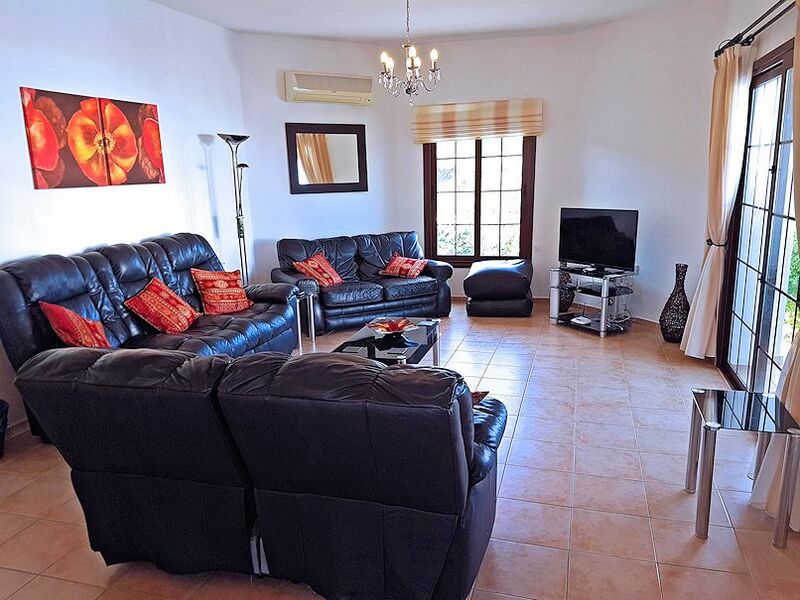 The villa sleeps 8 persons plus 2 babies/toddlers. For occupants over 5 persons, there is a supplement of £45 per person per week. For 2 occupants only, there would be a price reduction. Babies/toddlers under 2 years of age using cots are free. The rates are inclusive of a generous amount of free electricity, and free water, gas, bed linen/towels laundry, internet access, and the services of our local agents, so you would not get any nasty bills for additional charges at the end of your stay! There is a one-off supplement of £20 for hirers arriving/departing on a Sunday. We can accept bookings from 5 days or more but the minimum charge period is 1 week at the appropriate rate. We can be flexible on the number of days hired over 1 week. Longer term rentals during the Mid and High Seasons would be considered at reduced rates. Please contact us for a quotation. Low Season lettings (Nov - Mar) would only be considered for a minimum of 6 weeks. Many of the large online holiday rental companies try to scare potential hirers into thinking that they are much safer in booking a property online and making payments through their websites. While this does have an element of truth, the financial guarantees they offer are not always what they seem and have conditions attached. Additionally, some add an additional 10% - 15% booking fee to the advertised hiring charge but keep this largely hidden until guests have committed themselves to hiring a property. Some sites charge the owner 15% commission which means the owner has to uplift the hiring charges accordingly. Further, some owners do not want any direct dealings with their guests so prefer online booking. We, on the other hand, want to minimise the cost of booking Jasmine Villa to a minimum and develop a good direct relationship with guests. With Jasmine Villa, the price you see is the price you pay (sometimes less!). Do be aware of these factors when booking a property. Please read our document "Booking Direct Safely". Hire of the villa commences at 4.00pm on the first day and terminates at 10.00am on the final day of hire. All hand and bath towels and bed linen are supplied. Additional sets of linen/towels are supplied for hirings between 10 and 16 days. However, if further linen/towels is required, this can be provided for an extra fee. A washing machine is available if you chose to do your own. The villa is cleaned between changeovers. A basic welcome pack can be made available on your arrival at a price to be agreed. This would be tailored to your individual requirements but typically could contain a 5ltr bottle of water, milk, butter, bread, cereals, cheese, eggs, tea, coffee, sugar, jam. No smoking is permitted in the villa itself but smokers may use the terrace, patio and pool areas provided no cigarette/cigar ends are left. No pets are allowed. Water is heated by solar means and this is backed-up by an immersion heater (if necessary). The hire charge contains an allowance of 10% for free electricity usage. For example, if the hire charge totalled £1150, hirers would be allowed free electricity to the value of £115 during their stay before they would be liable for paying any excess amount. Meter readings would be taken at the start and finish of the letting period and the amount of electricity used calculated at the rate we are charged (currently £0.20 per kw). Any excess over and above the 10% allowance would be deducted from the returnable Security Deposit. The allowance, however, should in most cases be adequate provided air-conditioning and the immersion heater are not used excessively. This approach is taken as electricity in North Cyprus is relatively expensive and by controlling electricity usage, we can all help protect natural resources. As a guide, only five hirers have exceeded their allowance since 2010. IMPORTANT - Pool areas are dangerous and may become slippery when wet. Neither the owners nor their agents can be held liable for activities or accidents in and around the pool. It is the total responsibility of hirers to ensure that children and vulnerable persons are adequately supervised in the villa, garden, terrace, patio, and pool areas at all times irrespective of the safety features we have installed. Climbing on or over walls is strictly forbidden on safety grounds. Hirers should ensure that they are adequately insured prior to the commencement of their stay at the villa. In the case of cancellations, refunds will be made as follows: 56+ days before stay - 50% of hire charge; 28 - 55 days - 25% of hire charge; 0-27 days - none of hire charge refundable. The £200 Security Deposit would be refunded in full. Hirers are strongly recommended to have holiday insurance in force from the time of their booking to the time of their arrival home after their stay at the villa. A copy of the full terms and conditions (which form part of the booking contract) (see also link below) will be provided on confirmation of the booking. Information notes, location maps, key arrangements, etc. will be posted to the hirer following payment of the final balance - approximately 7 weeks before the commencement of hire. The hirer's full postal address and a contact phone number is required at the time of booking.